HyPower IM is an idle mitigation and cab comfort solution. Terex Utilities now offers customers another option to meet their green fleet needs with the new HyPower IM, the latest innovation in the HyPower hybrid solutions offering. HyPower IM is an idle mitigation and cab comfort solution. HyPower IM provides similar benefits as the HyPower Hybrid System, including reduced fuel usage and reduced exhaust emissions, but at a lower price point. The system automatically switches from plug in battery-stored power when the truck is idling to engine-supplied power when hydraulic controls are engaged. Because HyPower IM starts and stops automatically when the truck is put into park and when hydraulic controls engage, utility workers do not have to take physical action to switch from engine to battery powered systems. In addition, HyPower IM enables the truck cab to be heated or cooled without the engine running, utilizing the trucks heating and cooling vents. A 4 KWH package is required for the Cab Comfort feature; otherwise, a 1 KWH package will suffice for typical trouble truck applications. 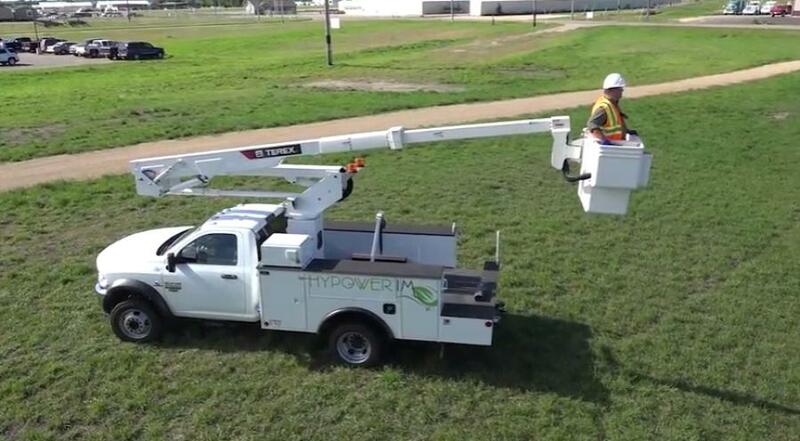 HyPower IM is currently available for Class 5 Chassis, such as Ford, Dodge, and GM trucks, used with Terex® Hi-Ranger™ telescopic aerial devices, such as the LT, LTM and TL series aerial devices. HyPower IM is a 48v Lithium ion battery system that charges from either a standard 120V plug in or the 12v chassis engine alternator during road travel. HyPower IM uses fewer, more high efficient batteries, decreasing overall vehicle weight and increasing payload capacity while still providing maximum fuel efficiency for customers. “HyPower IM provides an affordable solution for EEI member companies to meet Edison Electric Institute's goal of investing 5 percent of annual fleet budgets to plugin vehicles and technologies,” said Henderson. The system can be ordered with new Terex aerial devices or retrofitted on existing fleets. For more information on HyPower IM, visit http://info.terex.com/hypoweriminfo.